So here's the back story. 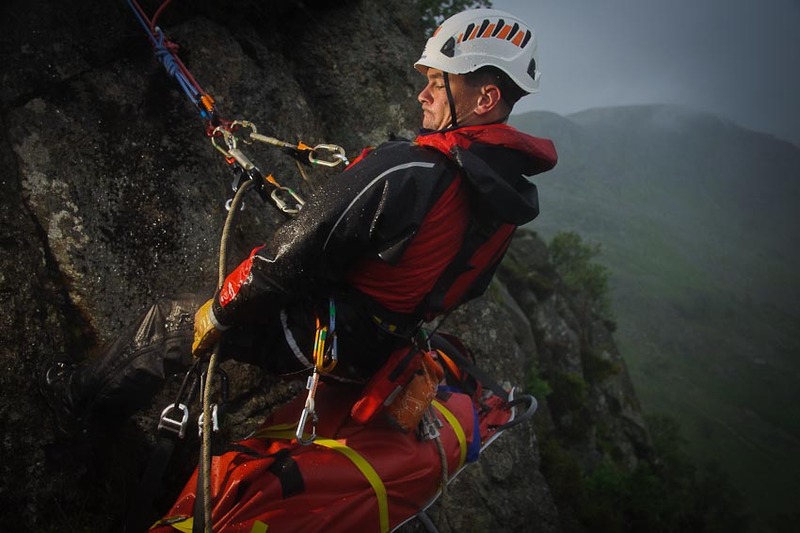 My client has a new product that can be used in cave and crag rescue applications and want's an authentic photo-shoot with a rescue team to demo the kit in use for real. The team (Penrith MRT - top guys, lots of thanks are due) are going to rig a stretcher evac' from a local crag location and one of them will volunteer to go in the stretcher. 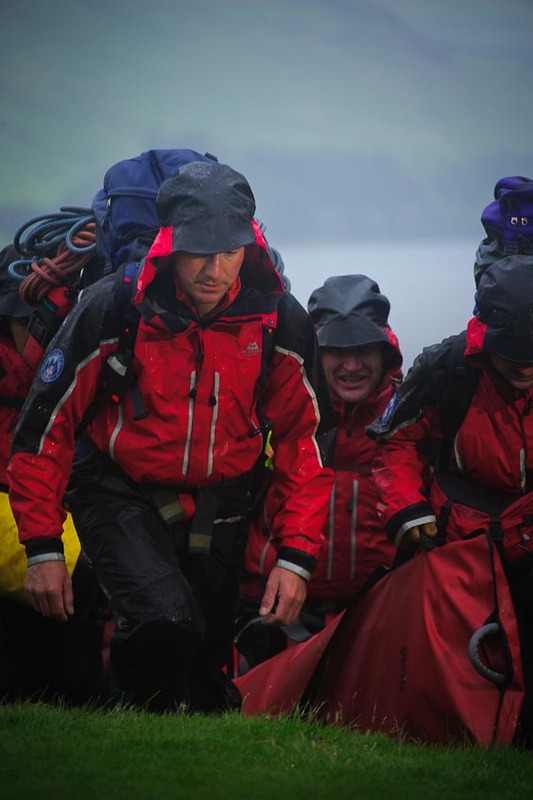 These guys are all volunteers, they don't get paid to do this for real, let alone for a photo-shoot and frankly I would not like to be the "casualty" on any day of the week and particularly not on the rainiest day we've had in the lakes for 10 years! I had looked at the weather forecast for the weekend and was certainly expecting it to rain. I even phoned my client in France and queried if they wanted to go ahead with the shoot. "Fantastique" - they said - "it will be for real, non?". Yes, it certainly would. I'm going to employ a lighting assistant, someone who's comfortable hanging off an abseil rope. I'm going to give him a pole with a remote flash attached in a waterproof housing. Triggering will be via Pocket Wizard TT5 Flex. I'm going to rig an ab' line next to the casualty and shoot wide angle, in close to get a dynamic "in your face" point of view (I hope). I can maybe add some more off-camera fill-in flash from another waterproof speed-light either on-camera or strapped to my leg or something. Maybe we can get some other flash units placed around the crag with some other team members. Yeah, that should work. We all meet up in the car park on Saturday morning and a ton of rescue kit is dished out among 8 or 10 MRT members in rain so hard it's bouncing of the ground. I already have my d700 in a waterproof rain cover and I'm praying that Nikon's famed weatherproofing is going to be up to the job. We have a good 45 minute tramp through driving rain, up to the crag and just to keep our spirits up it's getting windy too. Perfect. I do a team "walk-in" shot half way up, but the rain is driving right into the lens so I break out my secret weapon - my group bivvy shelter - so I can climb into it and shoot from within to keep my lens dry. I'm even thinking of getting one of those mini pop-up tents you see everywhere, just for situations like this. I think they'll be great for event-shoots where I'm sat in the same spot for an hour, in the rain. The team think I'm a woose but I don't care! I"m here to get the job done. We even light it nicely with my tupperware waterproof-housed, PW'ed flash system. I send my willing volunteer lighting assistant out into the lashing rain and howling gail to point the light at the team. Hey, you know, we might actually get away with this! After the photo-stop it's back to trudging through the storm, splashing up the watercourses that used to be footpaths, fording the raging torrents that used to be mountain streams and crawling up slimy scree slopes that used to be...slimy scree slopes. 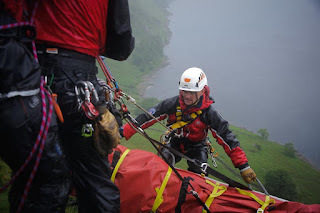 At the crag location, in the teeth of the weather, the team start rigging for the stretcher eveacuation and I can only sit back (in the relative comfort of my bivvy shelter) and admire the professional determination with which they go about this miserable, thankless task. Bottom line though, is that if anyone gets this wrong, the potential for a life threatening accident is very real. Needless to say, everything is done right and everything is backed up, checked and double -checked. Then it's time for the "casualty" to go over the edge and for my lighting assistant and I to clip in and abseil into position. So now it's time for me to earn my fee. A lot of time, effort, discomfort, sweat and effort has gone into getting all of this stuff into place. It might be lashing rain, dark and windy; I might be dangling from a wet rope balancing on slimy rocks and fighting to keep rain off the lens - but my client doesn't care. They are trusting me to do this and do it well. 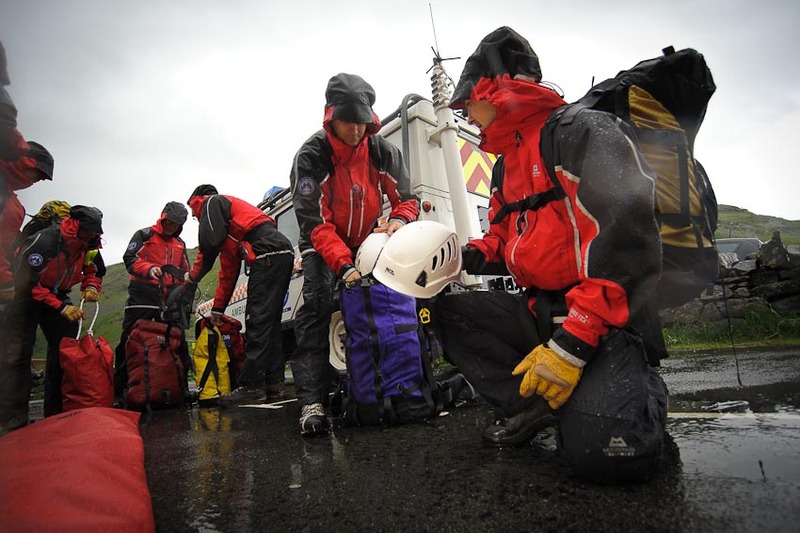 I'm expected to bring home a creative, eyecatching image that shows off their rescue products in a real-world situation. So that's what I'm goin' do. Everything that I've planned up to this point has been about creating something great out of just this exact situation. I've hauled up flash lighting gear, I've invested in off-camera flash triggering with the latest Pocket Wizard Flex system, I've experimented and perfected a waterproofing solution for both flash guns and camera and I've spent years working in outdoor pursuits just so that I'm in my element here, not floundering and scared. Now it all has to come together. Judge for yourself. The end result is at the top of the page. My client liked it. Job done. Cracking shots, love the blog - is that really a pair of googly eyes on the right hand rucksack on the walk-in shot?? Ho Ho! Thanks for the comments Dave, good to hear from you. Keep reading and spread the lurve! More coming soon.